Modern and quiet for the rest of the guests. Totally renovated in 2010, the B & B WHITE has three spacious bedrooms and large, all with independent personal balcony overlooking a downtown street. Equipped with TV, air conditioning, desk, Wi-fi and private bathroom equipped with color. Comfortably furnished and equipped characterized by a distinct modern style. 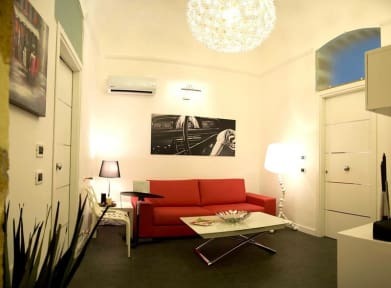 The b & b white is a structure that transmits its guests the warmth of our Sicily. 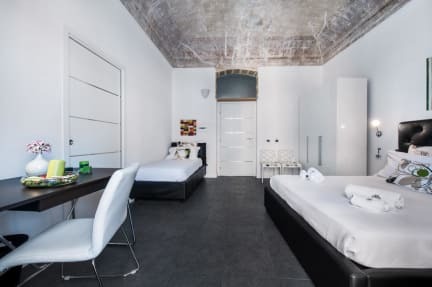 The rooms at B & B White have a modern and minimalist style, furnished with attention to detail and each is characterized by a useful name to identify them and choose when booking. White suite features a beautiful vaulted frescoed ceiling, Superior and Standard White White also with the unique modern style. The entire apartment is characterized by beautiful porcelain tile floors Versace. The bathrooms are designed to give comfort to five stars, you will transmit sensations of relaxation never felt before in a B & B.